Are things too big and out of hand? I’m bumping this one from September 2012 to the top of the queue. 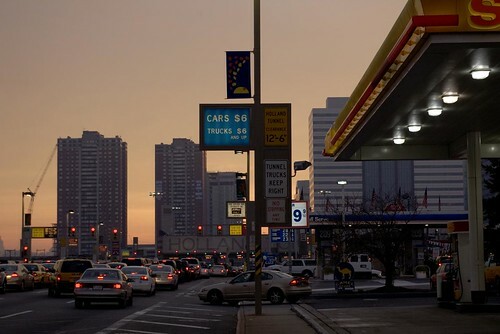 One day I waited an hour in traffic to go a quarter of a mile so I could enter the Holland Tunnel and cross under the Hudson River to my home in Jersey City. While sitting in the cue and kept thinking why why why? Why? In answer the question with a boiling-frog story, a parable about Happy Island. I conclude by suggesting that the world is happy island and we’re stuck in traffic. I live in Jersey City, New Jersey, which is across the Hudson River from Lower Manhattan. Whenever I go to Manhattan I use public transportation, which is reasonably good, though just a bit inconvenient from my present location. Driving my car through a tunnel or over a bridge and parking it on Manhattan, that’s VERY inconvenient. And so I avoid doing it. But I had to go to rural Connecticut to meet Charlie for a trip up to Vermont. I could have taken public transportation to a point where Charlie could pick me up. But that’s a longish walk and four trains, or a longish walk and three trains and a long walk or a cab. Which was a hassle. So I decided to drive. Yes, I’d have to cross the Hudson River, but the Holland Tunnel’s nearby and I could avoid rush-hour traffic on both trips, too and from. And driving on Manhattan was a bit of a hassle, but not too bad on this trip because I’d be mostly on the West Side Highway. So I drove. I left on Thursday morning at, say, 9:45 AM. By 11:30 I’d crossed off the northern end of Manhattan and was headed toward Connecticut. That’s an hour and forty-five minutes to go the first 15 miles, and probably an hour to go the first four miles, from my place in Jersey City through the Holland Tunnel and onto the West Side Highway headed North. 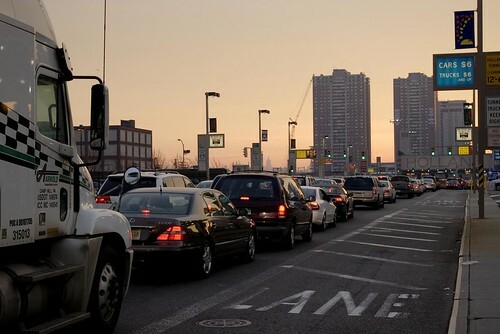 A month ago I used Holland Tunnel traffic as a vehicle for explaining how, with the best of intentions, our world has gotten too big and unwieldy. Here’s some photos of rush hour traffic that I took on November 27, 2006 at roughly 7AM. The tolls have doubled since then, not to mention the price of gas. Cynical rumour has it that the increase is mostly to fund the construction of One World Center. At 1776 feet tall–get it, 1776?–it’s the tallest office building in the USofA. And it’s a dog. The office space isn’t needed.